Don't bounce his head on ? blocks, please. He may be more into the plumbing business, but that doesn't mean Mario can't get involved in the bricklaying side of things too, as this story proves. Made as part of the LEGO World Fair, this blocky brother measures nearly 6' tall and weighs over 110lbs, so whilst it may not be a hugely realistic effigy of the plumber it certainly looks the part. It took over 40,000 bricks to make this stand-up fellow and after completion it was auctioned for charity, raising over $5,000 for the Netherlands' Ronald McDonald House Charity. Quite how they're going to send it in the post is as-yet uncertain. Man, I wish I'd kept my Lego. Everything I ever build with the Legos looked like crap. One thing I have no talent with are Legos. And whoever stuck with that Mario statue long enough to pull that off deserves some serious kudos. Wow! As a video game fan and a Lego enthusiast, this is basically my ultimate dream. omg this is soo cool! i wish i could make something like this! I've been playing a lot of lego recently, whilst babysitting mini-ones, this has inspired me to create Nintendo stuff. Yay! 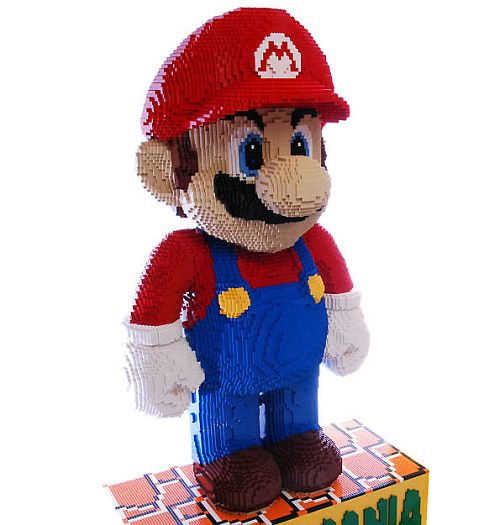 It must've taken alot of work to make a lego Mario with 40,000 blocks . Wow that is seriously awesome! I guess this is as close as we'll ever get to a Lego Super Mario Bros then, eh? Looks absolutely fantastic. Props to the person(s) who put it together; must have taken a lot of effort and time. i have enough Lego's and not enough time to look for the colors and then build it. I wonder if it's hollow. It wouldn't really make sense to fill in all those inner blocks that no one will see anyhow, wasting bricks, time, and increasing weight. LOL, echo what Giggsy said. @warioswoods: At 110lbs, it's gotta be solid. Probably needed to be to support the height. Great statue! Bah, with careful engineering they could have supported the height and still left a good bit of it hollowed out. But it's still quite an accomplishment. Best thing I've seen in a while. I wish I had the skills and patience to make something like that. All my original Lego creations were lame. 40,000! Wow! Thats so cool! I bet someone would get sued if someone dropped it. That's a pretty realistic LEGO statue of Mario. It looks amazing. That's amazing, I wish I had the patience to build something like that. I also wish I hadn't given all of my Legos to my brother. Seriously guys, no-one has enoung of each colour to make something like that, you'd have to work for the LEGO Company to get the required peices.